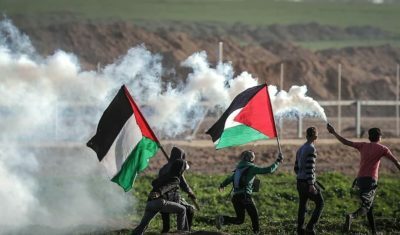 Across the Gaza Strip on Friday, Palestinian civilians held non-violent protests along the Gaza-Israel border as part of the ‘Great March of Return’ that has continued each Friday for nearly ten months. Israeli forces responded by attacking the protesters with live ammunition, concussion grenades and tear gas. Fourteen Palestinians were hospitalized with gunshot injuries, including a teenage girl, a young boy, a paramedic and a journalist. This marks the 44th weekly March of Return, a movement which began on March 30th 2018 with Palestinian protesters demanding an end to the Israeli siege and a right to return to their villages and towns occupied by Israel. According to the Palestinian Ministry of Health, a teenage girl was among those injured. She was shot with a live bullet in the leg on the eastern border of Gaza City. Another child, a boy, was reportedly injured east of Khan Younis in southern Gaza. In addition, a paramedic was injured in eastern Gaza City, and one journalist was injured in eastern al-Breij in the central Gaza Strip. Video footage shows that the paramedic was targeted by a high velocity tear gas canister fired at close range. These so-called ‘non-lethal weapons’ have caused death and permanent injuries when fired directly toward protesters, which is how they are used by the Israeli military. Protests took place in at least five locations, in northern, eastern and southern Gaza, where simultaneous protests took place at the border fence with Israel. Israeli snipers were stationed across the fence in military bases, and they fired at protesters as they neared the fence.